We tried three Magefesa models and Practika is our favorite. It has the heft of the premium cookers without the flashy design (or price) – but the savings is paid in quirks. Once the cook figures out the Practika’s naughty gasket and tricky valve this cooker gets the job done consistently, reliably and predictably. The Magefesa Practika Plus gets our top rating in this category because its features are not just comparable to premium pressure cookers. The extra-thick aluminum disk in the base and fill lines, which are often missing on mid-range pressure cookers, make sauteing a breeze and saves the cook from having to eye-ball and guess whether they’ve reached the maximum fill. Pressure Selector – Choose from four settings with a twist of a knob: High pressure 15psi (100kpa), low pressure 9psi (60kpa), pressure release and no pressure (to remove the valve). Easy to Clean Valve – The valve twists right out of its housing for easy rinsing and cleaning, without the need for tools or complicated operations. Fill Lines – Capacity marks inside the pot indicate, 1/2 full (maximum for cooking grains, beans and other foamy foods) and MAX (maximum for regular pressure cooking). The Magefesa Practika Plus has the standard set of redundant safety features, comparable to its peers. An oddly-placed lid vent gives this cooker’s score a small ding. Self-locking Handle – When the red pressure indicator begins to rise, it will automatically lock the pressure cooker closed preventing the cook from opening it accidentally while the contents are under pressure. Correct Placement Nub – A small metal projection inside the lid, that pushes the gasket slightly out of alignment to stop the cooker from building pressure if the lid is just rested on top of the cooker or the lid is not properly locked. Primary over-pressure release valve – Integrated in the pressure selector, it activates to release pressure if internal pressure exceeds 18 PSI it begins to release excess pressure. Secondary safety valve – Integrated in the red pressure signal activates if the primary should be obstructed or not working properly to release pressure. Gasket vent – The safety vent is a cut-out on the lid and comes into action in case any of the previous safety measures were to fail. The gasket will buckle and allow pressure (and some of the contents of the pressure cooker) out of the pressure cooker. The cook should always point this cut-out in the rim away from him while operating the pressure cooker. Unfortunately, the vent of this cooker is on the left, while the pressure release is exhausted to the right. This means that this vent must point towards the cook in order for the pressure release to point towards the cooking back splash. Overall the Magefesa Practika Plus’s performance was above average. It’s great that the cook can select pressure by twisting a knob but it’s tricky to turn and we really didn’t like how the pressure indicator behaves or how difficult it is to see. A few more kinks, such as gasket placement and multi-language lid, may cause new cooks to stumble. On the plus side, releasing pressure is a snap and we found an undocumented way to regulate the speed of the pressure release, too! Selecting pressure is tricky with this pressure cooker because the cook must push down on the selector slightly while simultaneously twisting it – like the safety-cap of a medicine bottle. Push and twist the knob to I for low pressure (9psi) and II for high pressure (15psi), the little cloud to release pressure and the circle with a slash going through it to remove the valve for cleaning. The selections are not easy to see – you need some very bright lights to see the raised black lettering on the black handle. The pressure indicator is a red metallic rod in the lid/handle casing. We dinged this cooker’s score in this category twice because the indicator is difficult to see and it’s tricky to ascertain when full pressure has actually been attained. The cook needs to lean over the cooker and look inside the hole to see it when it has no pressure. When it does rise, it does so to just under the casing. So, again the cook would have to lean over and look at the lid to understand if the indicator is up or down but without any obvious reference point. We don’t like how this pressure cooker indicates reaching full pressure for the same reason we didn’t like how the Fagor Futuro did it. That’s because the indicator rises when the cooker is reaching pressure, not when it has reached the full pressure chosen by the selector. This can confuse beginners into turning down the heat before the cooker has actually reached the selected pressure – making the cooker appear as if it cannot maintain pressure. In fact, a popular American cooking magazine wrongfully declared this cooker troublesome and unable to reach or maintain pressure in its reviews and we suspect the signal’s tricky function was the cause. The only way to make sure that this cooker has reached the full cooking pressure is to either wait for the cooker to gently blow a stream of vapor from selector valve or by touching the indicator. Using a toothpick (not finger) the cook can touch the red metal signal rod to check if the signal is firmly in place. If the signal feels springy full pressure has not been reached, yet, and the cooker must remain on high heat to continue to building pressure until the signal is firm. It’s worth noting that Magefesa’s newer pressure cooker Model, Rapid III, has fixed this issue by using two pressure indicators. However, we chose not to review the Rapid III because of some minor design flaws that only affect is usability – of which we informed the manufacturer. All of the Magefesa pressure cooker models we’ve seen so far tend to have gaskets that do not automagically go in the correct position. Before starting to cook with the Magefesa Practika, the cook needs to ensure that the gasket is under the gasket guides in the lip of the lid and passing in front the correct placement nub (as shown). Trying to close the lid of any Magafesa pressure cooker with a gasket that is out of alignment can be both frustrating to the cook and damaging to the gasket! The only big surprise, both for us and the manufacturer, was that we measured the cooker cooking at an average of 118°C and not the expected 120°C (about 15psi) as stated in their cooker’s specifications. 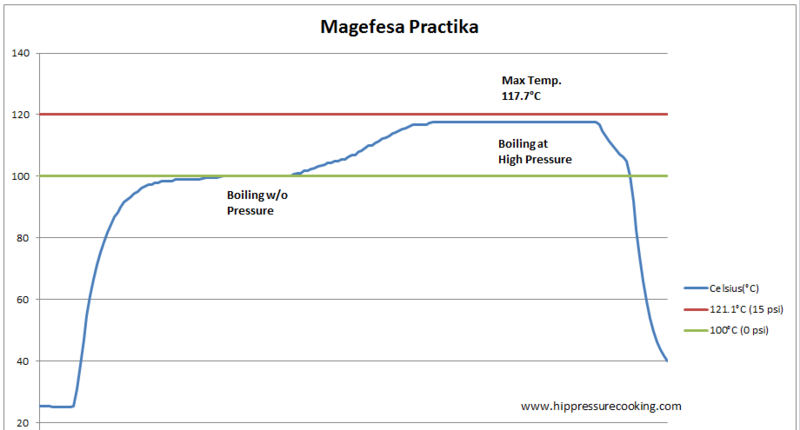 Also, Magefesa Practika Plus’ evaporation rate was just a tad bit higher than comparable pressure cookers 4.5% (compared to 3.5% evaporation rate from Fagor Futuro) but required much less heat to maintain pressure knob position 1.8 compared to 2.75. Releasing pressure on the Magefesa Practika Plus is easy. Just twist the selector knob to the release position and go do something else. It was designed assuming the cook would turn the handle of the cooker to the right in order for the steam to spray towards the backsplash of the cooktop (unlike other models where the manufacturer assumes the cooker will be used with the handle pointing towards the cook). While testing and using this pressure cooker we found an undocumented way to regulate the speed of the pressure release- useful when releasing pressure for foamy foods or trying to accelerate a natural release. While most selector-type cookers, like this one, include a selection to release pressure usually the only way to release it is full throddle. This is where the aforementioned tricky medicine bottle safety-cap style operation of the selector becomes an advantage. Once on the selector is moved to the “pressure release” position, the selector can be pushed down all the way stop the pressure release completely or slowly lifted to the cook’s preference for a slow, medium or full speed pressure pressure release. We don’t ding for this but it’s worth noting that the lid is unnecessarily written in two languages. The arrows on either side of the red button should indicate “Open” and “Close.” Instead the Magefesa Practika shows the letter “C” for closed and “A” to open (Cerrado and Abierto in Spanish). Then, around the pressure signal and on the handle is written “Gebrauchsanweisung Beachten” which just means “Read Instructions before use” but this time in German. It struck us as odd because most manufacturers use symbols that can be interpreted internationally such as a picture of an instruction book and icons of either little locks or pots to indicate which way the cooker handle or lock needs to move to open or close. We were disappointed to discover this pressure cooker requires hand- washing only for all parts. Because of the lack of convenience, we gave the cooker two dings in this area. Depending on the retailer, some Magefesa Practika pressure cookers come with a trivet and steamer basket. We did not receive a set so we cannot comment on their quality or practicality. This cooker has the heft and safety of a premium cooker without the fancy features, or fancy price tag – bu the savings comes at a price. The pressure selector can be tricky to turn and it takes a bit of study to understand, or see, when this cooker has reached pressure but it has a thick aluminum disk in the base which gives it heft and along with fill lines – which makes using it practical. With a little extra attention to the correct placement of the gasket and understanding of how this cooker signals it has reached pressure, this cooker never failed to reach or maintain pressure for us – and not just during our tests, we used this cooker at least weekly for several months before and after testing as well. This pressure cooker does require a little bit of attention, and the familiarizing process is a bit longer compared to its peers but once once all its little intricacies are understood it will become a dependable member of your kitchen arsenal. NOTE: This review was fact-checked by the Regional Sales Manager of Magefesa USA and Magefesa headquarters in Spain prior to publication. I can never understand why manufacturers of kitchenware don’t make things dishwasher-safe. This is the 21st century! I can see it’s a stainless steel pressure cooker too, so why it can’t go into the dishwasher is anyone’s guess – the interior of dishwashers are stainless steel (at least in Europe anyway). I’ve not had any problems using the dishwasher to clean my Fagor pressure cooker for several years, so why can’t this Megafesa go into the dishwasher? Also, this Megafesa never reached 120-121 °C at 15 psi, but would it have reached that temperature if steam was allowed to flow (gently) from the dial at high pressure? David, the Magefesa is very similar to your Fagor in operation. This means that the cooker MUST vent very lightly to maintain pressure. There is a photo of the cooker venting during operation in the “Pressure Selection & Indicator” section, above. The vapor is very visible because I took the photo on a cold day – but this is generally how I tested and use the Practika. Regarding dishwashers, you’d be surprised how different they are in the U.S. mid-range dishwashers have a plastic interior and even the water in-takes are different – there are two one for hot and one for cold water (ditto with the washing machines). Don’t get me started on the totally energy inefficient ancient water-heaters/tanks!! Laura, thank you for reviewing this model. A few years ago, when I wanted a small cooker, I bought a Practika Plus in the 3.2-liter size and have been quite happy with it. I think it may be the most underrated PC on the North American market. It’s sturdy, easy to use, maintains high pressure on very low heat, and sells for a modest price. Thanks to long experience with Fagor cookers and their yellow pop-up indicators, I’ve never had any difficulty telling when the Magefesa is at full pressure: steam comes blasting out of the valve, and the red pin can’t be budged with a chopstick (an indispensable pressure-testing instrument). I haven’t found the push-and-twist motion for the valve, or the minimal labeling on the handle, to be at all problematic. As for not being dishwasher safe, I hand-wash my cookware anyway, so that’s not an issue for me. Yes, it loses more liquid than my Kuhn Rikon – but not enough to be troublesome. Yes, it’s less smoothly finished on the inside than my Kuhn Rikon, so it doesn’t clean up quite as beautifully – but it’s a workhorse, so I don’t mind. In my opinion, it’s a very good product and I’m pleased that it’s getting some publicity. Thank you for sharing your experience with the Practika, especially how it compares to Fagor and Kuhn Rikon! I think I have the same pressure cooker put on the market with a different label. It is called Elo Praktika Plus and is sold in Germany. It has 2.7l capacity (also comes with other capacities). Its design is almost exactly like the Magefesa cookers except for the button for closing the lid, it’s not red but blue. It reaches pressure pretty quickly with a short time of constant hissing and steam coming out of the valve before the pressure indicator comes up. I googled ELO, and you’re right. They look AWFULLY similar to Magefesa! The details in the handles, valve, they’re all appear to made with the same stamp. I have an e-mail in to Magefesa asking them if their factory is producing these cookers for ELO. Either way, at least the bake-a-lite parts appear to be coming from the same place. I can’t speak about this particular model. I can speak about Magefesa’s outstanding customer service and warranty/repair division. Amazingly good. I hope I don’t need another PC, but if I do, I will buy from Magefesa again. On this page, I read that steam comes out of the valve (the “primary over-pressure release valve” – item 3 on the “Safety” list) at 18 psi, but the internal temperature only reached 117°C in your testing. Given that water boils at around 120°C at 15 psi, how can the temperature at 18 psi only be 117°C? I’m confused. The photos do show steam coming out of that valve. The reason you see the discrepancy is because the cookers are not measured in over-pressure. I follow each cooker’s manufacturer instructions to bringing the cooker to pressure during the test and measure the internal temperature to simulate a real-world cooking scenario (the actual temperature the food would cook) . It sounds like the manufacturer’s instructions don’t give a clear explanation of when cooking pressure has been reached. I’m sure plenty of newbies will turn down the heat too soon and wonder why everything is raw or others will wait for the steam to come out at 18 psi and hope for the best! I wonder if my own Fagor is working *above* 15 psi when steam escapes from its dial at high pressure? I can’t help wondering now lol. hello, I have a Magefesa Star (bar across the top) model and wonder if you have any information on this model. Have you ever reviewed it, used it, etc. I lost my manual and the company only provides a replacement that has minimal information in it (no recipes, etc.) I contacted them and they directed my to you tube but all the videos are in Spanish (I don’t speak Spanish). Because these PC don’t have adjustable pressure valves, I’m finding it difficult to learn to use it. Any advice?? Have you had a look at Laura’s collection of manuals to see if one is similar? Thta bar across the top sounds like the one she lists as “Rapid” The same model often gets a different name in different markets. I had a quick look and yes that is the Star. The manual states the operating pressure is 0.55 kgs/cms^2 This equates to about 8 psi which is low pressure for most PCs You will be able to use most of the recipes on this site, but you will need to extend the cooking time a fair bit. Laura’s “long” time is for 11 psi Cookers. so you will need to add a few more minutes even to that. After you have cooked a few things, you will get a feel for how much you will need to extend the time for your PC. Remember you can always put the lid back on and cook some more if it is not quite done. You may need an understanding spouse though. Hi! I just purchased the set on Amazon Warehouse Deals and I can’t tell if it’s functioning properly. I previously had a jiggle weight pressure cooker, so this is my first experience with one where the valve is in the handle. I brought the cooker to high pressure then lowered to the temp I normally do on my gas stove. However the steam continued to flow pretty strongly from the valve even after turning to low. Is that to be expected?? Or do I need to lower the temperature further?? (I have a gas stove with temp setting 1 – 6. I brought to temp on 5 and then turned down to 3, as that was my typical settings on the old cooker.) TIA!!! Your new Magefesa is a spring-valve cooker and will need MUCH LESS heat than your jiggler. Lower the heat to 2 or 3 – maybe even 1. What you’re looking for is a gentle stream of steam and a soft “ssss…” sound (like the hissing of a snake) and not the “SSSSSSHHHHHH!!!! !” of a librarian reprimanding someone who is talking loudly in the stacks. Hi – Did you ever hear from ELO? Is it the same cooker as the Magefesa? Thanks! Kevin, I have not personally experienced the problems you describe with this model. Usually, a cooker has difficulty reaching pressure if there is not enough liquid in the recipe for it to reach pressure. I have, as you see in the review, had problems placing the gasket correctly and an incorrectly placed gasket is going to prevent a pressure cooker from building pressure. Also, the only times Iìve had the indicator stuck was when it was clogged-up with split-pea soup – I had to clean it throughly several times to get everything to work right again. The starch from salted rice can also be an issue (basically don’t add salt until you’re done and open with natural release : ). The Maghefesa seals are all silicone and do not damage as easily as silicone blends or rubber seals. I have not had any problems with them (my WMF seal wore out first, comparitvely). The silicone gaskets need to be left to cool un-disturbed prior to washing as they expand when they are hot and you don’t want to be pulling on them until they’ve had a chance to shrink back to the original size. If you’re buying the pressure cooker from amazon – do a search there – when I checked the US amazon there was also an extra gasket for sale at a reasonable price. You might want to see who can give you the best price/shipping from France amazon as well. Hi Laura thanx for your reply.The seller of the 3.3 quart seal dont ship to mauritius.But i have asked the Amazon community how long does it lasts and was pleaseantly surprised to learn That it lasts at least 2 yrs and some even said more than 4 which Is Great.How long have You used it before You changed it?I have bought the 3.3 quart on Amazon for $52.9 and was impressed by the quality of the steel.A review on Overstock said That This model Is made in Spain and the big was made in china.Now im not worried because i dont have to replace the seal before a long time.Thanx very Much for telling the thickness of the aluminium disk in the review because This Is one of the reasons i bought it. I still haven’t changed the seal on the Maghefesa. It’s very well made. Make sure to store the pressure cooker with the lid upsdie-down so the gasket has a chance to air-out. I have an about a 20 year old Fagor Pressure Cooker. I was wondering if the metal is made different today? When I cook in the old Fagor, there is a “crock-pot” after taste to the food. My nutrition needs require nutritious stews and broths as one of my main sources of nutrition. I wonder if I should buy a new one? Would the food taste better? I want one that’s quality made. Will this Magefesa Practicka from Spain work for me? Thank you kindly for your insight- I appreciate it! Tina, yes there could be different metal blends based on the pressure cooker model even today between models from the same manufacturer. But, personally, I think the “crock-pot” after taste you are describing – which is uniform flavor between all ingredients (ie: zucchini taste like ham and zucchini and ham tastes like ham and zucchini) is the result of the pressure cooker’s natural flavor infusion. I recommend trying some of my recipes – specifically ones that have you add ingredients at different points during cooking, or steam foods on different levels, or even just mix-in garlic AFTER pressure cooking. All those are techniques for breaking up an otherwise monotonous one-note flavor that comes from pressure cooking and slow cooking foods. Thank you for this excellent review. I have a 6 qt IP, and am looking for a second, small stovetop PC for my travel trailer & to supplement the IO at home. Looks like the Practika may meet my needs. MY QUESTION: what is the pros & cons of using a energy saver/flame protector? Should I purchase this device all night with the stovetop PC? While also researching WMF & Kuhn Rikon, I noticed that they recommended energy savers/flame protector for gas stove tops. Both our kitchen & trailer galley have older, gas stoves which are particularly efficient for controlling low flames. Thanks for your reply. I realize that I misstated the situation with my gas stoves: they are particularly inefficient at controlling low flames (I mistakenly wrote “efficient). So, I do have an issue with the flame control on both stoves. However, you indicated that since the Practika has a solid disk, I do not need a flame protector. Even though I have never used a stovetop PC, my experience with my IP should help me work through the Practika’s idiosyncrasies outlined in your review? Finally, I have a request for pressure cooker school (excellent video series! ): With the Pressure Cooker, it is so easy to cook & freeze soup stock, beans & grains. But I am very confused on how I can take these frozen items and combine them into various recipes using the pressure cooker. How much time at pressure for frozen, soaked beans vs frozen cooked beans? Can you freeze grains? Is there a difference in taste when you freeze either beans or grains. What happens to time under pressure when you combine either frozen uncooked grains with the frozen beans & stock? Raw or cooked meat/chicken? With frozen, cooked food, what best release method? I’d really appreciate at least one lesson on this subject. Maybe a time chart for frozen beans & grains? I’ve tried to research this, but haven’t gotten useful answers. FYI, I got the IP for making plant based meals – which are extremely time intensive. So going to the next level using frozen beans & grains would really simplify & speed up weeknight dinner prep. Jane P. If you have my cookbook, Hip Pressure Cooking: Fast, Fresh & Flavorful, I share my frozen bean strategies and cooking times at the beginning of that chapter. It’s not something I’m going to add to the cooking chart, at this time. Sorry to take so long to reply. Last week, I purchased your cook book & the 3.2 L Magefesa Practika plus. My husband & I are exploring your cook book, and I’ll revisit my freezer question after I have a chance to review the bean section. But first I have some concerns about my new Magefesa. FYI, it came with the silicone gasket already installed. I checked the gasket’s position against your pictures to confirm it was installed correctly. Also, I really like the pressure selector knob. It’s very easy to turn, and the “pics” are easy to understand. My concern is with evaporation rate. After reading the owner’s manual, I did the water test from “Vegan Under Pressure”: 2 cups H2O @ high pressure for 5 minutes. At 5 minutes, I turned the stove off & did a quick release. I returned the water to the measuring cup and saw that half of cup of water was lost. Per Jill Nussinow, virtually no water should be lost. In fact I did this test when I got my instant pot, and no water was lost. As the Magefesa was coming to pressure, I monitored the pressure indicator & used a chop stick to verify that the pressure indicater was solidly up before turning down the heat. It did seem to me that a lot of steam was coming out of the pressure selector as the pot reached pressure. The steam continued to pour out at about the same rate after I turned the heat down. I have no idea if this is normal. I let everything cool down & repeated the test several hours later with the same results. I did experiment on varying the gas flame to determine minimum level needed to maintain pressure. But that should not have dramatically affected the water test. I am concerned that so much water was lost. I do not know if I did something wrong or if the PC itself is defective. I know from your review that the Practika Plus has a relatively high evaporation rate. So, is the loss of half a cup of liquid over a 5 minute period to be expected for this pressure cooker? Jane, this can also happen if someone does not turn down the heat once the cooker has reached pressure. To know how much to turn down the heat it will take a little practice and maybe three tries. You want to lower the heat enough so that it does not vent as forcefully as it did when reaching pressure, but does not loose pressure. You’ll want to see how low you can go and then know that this may change going forward depending on how full or cold the ingredients are inside. If you don’t lower the heat, vapor will keep exiting the valve during the test and that would be a cause of the excess evaporation. If you followed Jill’s guidelines you probably already know this but you’d be surprised how often this happens to those new to stovetop pressure cookers! So I repeated the water test two more times. I am now an expert at recognizing when my Practika Plus reaches pressure. The tests were partially successful as I only lost 1/4 cup of water with both tests. I was trying to follow Jill’s guidelines, but am frankly surprised at how low a flame is required to maintain pressure. You’ve been a great help in describing the problem. My stovetop is very old, and I find it challenging to determine the correct flame. The knobs don’t help as they have gross indicator guides. I have to guesstimate by eye. So, upon reaching pressure, I am turning down the heat as quickly as possible & continuously testing the pressure indicator button with a chop stick during the 5 minute period. Also listening for the snake-like hissing sound from the selector valve that you described in an earlier post. However, I’m wondering if I am pushing down too hard on the pressure indicator, causing excess evaporation. Maybe I should set the flame, listen for the hiss, test the PI halfway through the water test and see what happens. Glad to read you’re getting used to it and getting better results. To check if the indicator is stiff, just touch it lightly (with the chopstick) to see if there is any give. Not many people have the patience you have and many give up pressure cooking at the very beginning because of the number of trials it takes to “know” a cooker. That’s why I steer my readers towards electrics, now – much less futzing around!! Long overdue progress report. Sorry for delay, but super busy. So, I got H2O loss down to 1/8 cup, which is “good enough”. So, I am satisfied that my Magefesa works properly. I then proceeded to wash the pot & lid, boil water in the pot, and oil the gasket & pot. Which brings up another question: do you lightly coat the gasket with oil after each usage as recommended by the manufacturer? I do not apply oil to the gasket on my Instant Pot. Using your HP Cook book, I cooked a cup of brown, jasmine rice for my husband & me. The stovetop PC performed perfectly. Unfortunately, I made a mistake with the recipe: I cooked it at pressure for one minute thinking it should be cooked like white jasmine rice. So, upon opening the lid, I found undercooked rice and excess liquid. I brought it back to pressure for another 2-3 minutes. The result was alden te rice for two – which was quite good. After dinner, I looked up cooking times for brown jasmine rice in Jill Nussinow’s book & saw 22 minutes, which seems excessive for 1 cup of dry rice/1.25 cups liquid. Moving on, I plan to prepare risotto tomorrow. Now I obviously require more time with the stovetop PC – which I purchased to supplement my Instant Pot & for my travel trailer. But I must say the IP, once I understood what buttons to press in what sequence, became super easy to use & can be left alone to do it’s own thing. Not so with the stovetop: it requires a babysitter to turn down the burner when it reaches pressure, and take it off the stove when the prescribed time at pressure is up. counter space. Hence, the Magefesa. I’ll report back after I cook more stuff. So, I have prepared several recipes at home. I particularly love making risotto on the stovetop & have gone through all your cookbook’s risotto variations. The more I use the Magefesa, the more I appreciate it. I am now camping in our travel trailer with my husband & we put together a somewhat complicated chicken recipe from scratch by consulting several recipes to determine time under pressure & type of release. It turned out very good. To my delight, the travel trailer gas stove pairs very well with the pressure cooker. I did the 5 minute water test & lost zilch water! Also used the Magefesa to defrost lentil chicken soup & a veggie stew I cooked with my IP. I really appreciate you can use it as a regular pot as well as a pressure cooker without having to buy a separate lid. So, the combo electric/stovetop pressure cooker combo is working very well for me. I really love the Instant Pot. But the Magefesa is a perfect second pot. It really enhances our lifestyle. Took my Magefesa 3.3 Qt Practika Plus to Montana in our travel trailer. I also packed my Hip PC cook book. We had an electrical hook up, but very happy with this stovetop PC as it has a much smaller footprint than our Instant Pot. My husband, who was lukewarm towards PCs, became much more enthusiastic on this trip. We made a variety of dishes – all delicious – throughout the month, and the Magefesa performed perfectly. It is a little over half the size of my IP, so we had to half most of the recipes. The portions satisfied our hunger but it is not large enough to invite dinner guests. It also took some “experiments” for us to recognize in advance which recipes need to be halved. I am so happy I read Laura’s review & decided to purchase it.